The Mac Snow Leopard alias might look like a standard icon, but it sports a tiny curved arrow at the base that points to another application or folder. Essentially, an alias is a link to something else on your system. For example, an Adobe Photoshop alias can run Photoshop just as the actual program icon can, but it takes up only a scant few bytes on your hard drive. 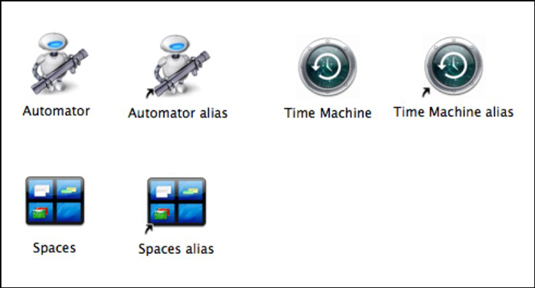 An alias is a pointer to another application, file, or folder. They allow you to launch applications and open files and folders from anywhere in your system. For example, you might want an alias in your MP3 folder that runs the DVD-burning application Toast. With an alias icon, you can launch Toast and burn a data DVD without navigating to the Toast folder, which could be nested in goodness-knows-how-many layers of subfolders. They can be easily deleted when no longer needed without wreaking havoc on the original application, file, or folder. If you decide that you’d rather use iTunes to burn audio CDs, you can simply delete the Toast alias without trashing Toast itself. Their tiny size allows you to add multiple aliases (and mucho convenience) for a single application without gulping down hard drive space. You might be wondering, “Why use aliases when I can just copy the actual application, file, or folder to the desired spot?” Well, indeed you can do that. However, the application might not work in its new location because you didn’t copy any of the supporting files that most applications need to run. (An alias actually runs the original application or opens the original file or folder, so things should work just as if you’d double-clicked the original icon.) Additionally, remember that copying applications willy-nilly throughout your hard drive will eat up territory like a horde of angry Vikings. If you dislike the alias hanging off the end of the icon name, feel free to rename it. The alias continues to function no matter what moniker you give it. If you create an alias by holding down Command+Option while dragging the original icon to a new location, the alias name won’t include the alias appendage. If the original file no longer exists, an alias naturally no longer works, either. However, Snow Leopard is sharp enough to automatically “fix” an alias if you rename or move the original file, pointing it to the new location (as long as it remains on the same volume).